Two Atlantic Puffins are at a standstill as they chat amongst themselves atop Bird Island in Bonavista Bay in Newfoundland, Canada. These two Atlantic Puffins who return to Bird Island in Bonavista Bay in Newfoundland, Canada, appear to be fond of each other as they have probably been with each other for many years when they return to the colony to breed. Atlantic Puffins are known to keep the same mate and dwelling every year and Bird Island seems to be a favorite spot for these birds which is out of reach from any predators which may linger around the area. Atlantic Puffins, Fratercula artica, nesting on Bird Island just off shore from Cape Bonavista Lighthouse, Bonavista Peninsula, Bonavista Bay, Discovery Trail, Newfoundland Labrador, Newfoundland, Canada. 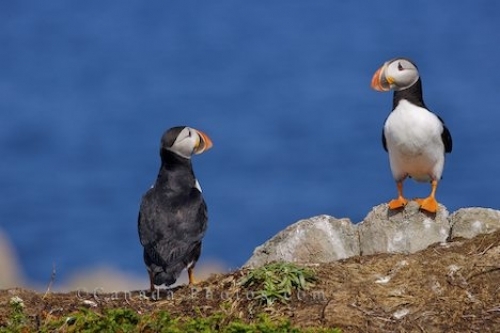 Picture of two Atlantic Puffins, most likely mates, atop Bird Island in Newfoundland, Canada during the spring months.